We’ve had a few weeks to play around with the ODA in our office, and I’ve been able to crack it open and get to into the software and hardware that powers it. Pictures of a real live ODA after the break. If you’re anything like me, the first thing you wanted to know about the ODA is what’s inside? Follow along as we walk through the hardware involved. The SC is essentially Oracle’s term for the blades that sit inside the Sun Fire X4370 M2. 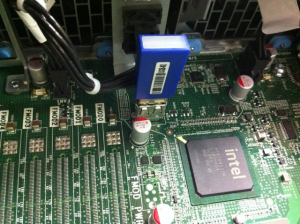 From the back, you can see the PCI cards on the left, and the onboard ports on the right. In the middle are the fan modules. On the left, we have 4, gigabit ethernet ports, 2, 10GbE (SFP+) ports, and the 2 external SAS connections. On the right are the dual gigabit ethernet (onboard) ports, the serial and network ports for the ILOM, and your standard VGA and USB ports. 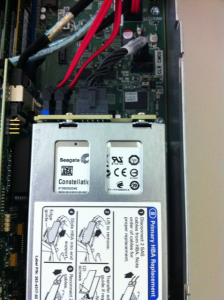 Above the onboard ports are the 500GB SATA hard drives used for the operating system. Along with the serial ATA drives is a 4GB USB flash stick that can be used to create a bootable rescue installation of Oracle Enterprise Linux. Also, this drive is used for some firmware updates. 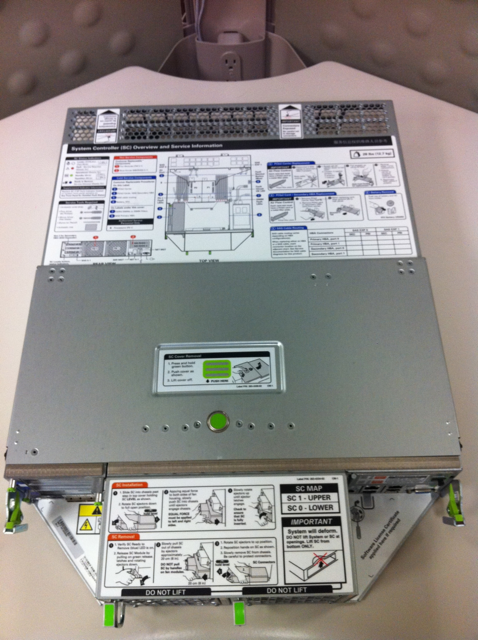 As for the disk controllers, each SC has 2 LSI controllers. One is on the internal PCIe slot, and another is on a standard PCIe slot. 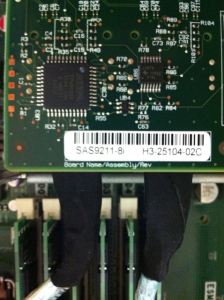 They are the SAS9211-8i controller. One of the many things that I found interesting on the box was that OEL 5.5 was installed, not one of the newer releases. Also, the server is running the RedHat compatible kernel, and not the Unbreakable Enterprise Kernel (UEK), which is the default on newer releases of OEL 5. Let’s look at the LVM setup a little closer. We have a physical volume with a 465GB volume group (VolGroupSys). From here, we have LogVolRoot (30GB), LogVolOpt (60GB), and LogVolU01 (100GB). That leaves us with more than 250GB free on each SC for either adding new filesystems, growing existing filesystems, or taking LVM snapshots. Surprisingly, these NICs aren’t bonded, so we have 2 separate cluster interconnects, which means that we also have 2 HAIP devices. Also, eth1 and eth2 (the onboard NICs) were used to create a bond for the public traffic. Note that the default configuration of the ODA doesn’t include a management network, like the Exadata does. That doesn’t mean that you can’t set up a management network, just that it’s not part of the initial setup process. There’s a little overview of what’s inside the ODA. The next piece in the series will go into a little more detail on the disks, as well as the Oracle configuration. X4370M2? That’s just silly when there was no M1. Don’t put it past Oracle….they started the database product with version 2. 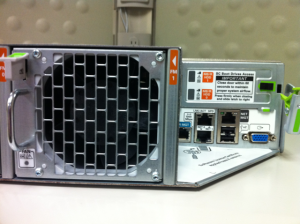 The would have been a Sun product in development called X4370. Since Oracle’s acquisition of Sun the product has been further developed and thus tagged M2. 2)there is 4 more slots open, can one add more SSD? 4)what is the function of two UART port? 5)any picture of two SAS HBA connect to both server? When I’m back in the office, I’ll try to get some more pics of the inside. We’ll see if I can get the guys to let me take one of the nodes down. Only one thing: The DBFS_DG is not wasted space if you implement the DBFS database (therefore the new name of the diskgroup) with it’s tablespaces there. That is the recommended way to host flat files (that you may use for SQL*Loader or External Tables) on Exadata. Andy are there any gotchas with the shared storage ? Can you address it from each controller on each SC ? Assuming you want a volume on each SC. 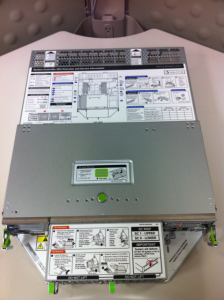 Do you have to take the triple protection on the controller or could you take a two raid 6 volumes at 4800GB each ? The shared storage is configured to be used within ASM diskgroups. By default, there are 3 diskgroups created: DATA, RECO, and REDO. If you want a shared filesystem between the 2 SCs, you will use either external NFS storage, or create a volume using ACFS. It is my understanding that the only protection for the ASM disks is through ASM redundancy, which we have seen to be very resilient. High redundancy is how the box was set up by the configurator, and there was not an option through the GUI to change that. If you are running this in a production environment, I would definitely recommend running with high redundancy. There is no hardware RAID used on the ASM disks. The 500GB disks that are in the back are isolated to each SC. 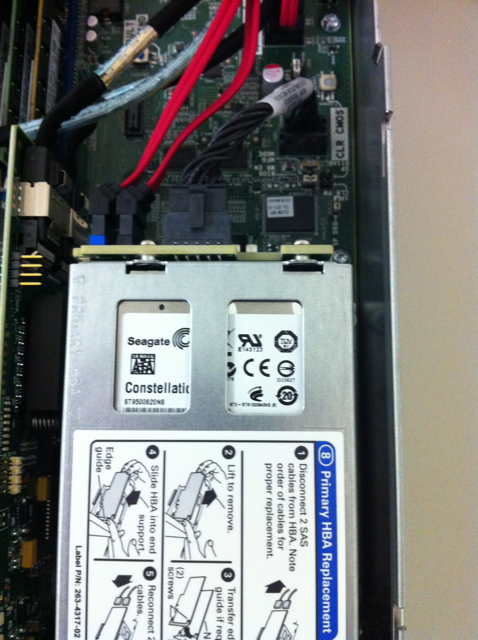 One thing that I mentioned above were the 2 external SAS ports. I’ve heard from a couple of people at Oracle that the ODA does not support using these external connections. It sounds like (no official confirmation) that the only supported methods of storage expansion are using NFS (preferably direct NFS) and iSCSI. We’re working on iSCSI in our lab, and it’s not as straightforward as you would expect. Results on that in a future post. Can you please tell me what are ip address requirement for EE single node installation? Is that 2 ip per ODA is enough for EE single node installation? No matter what your configuration is, you will need 8 IP addresses. That includes 2 for the ILOMs (each SC has an ILOM), 2 for the SCs, 2 for VIPs (each SC will have a vip), and 2 for the scan (because the cluster will only have 2 nodes, it only needs 2 IPs for the scan). While it isn’t required to have the ILOMs connected to the network, it is definitely recommended. Also, even if you chose to not run RAC for the ODA, you will still get a clustered grid infrastructure, which will utilize the VIPs and scan. This is included free of charge when you license enterprise edition. There is a requirement that the interconnect will use switched network and not cross cable. b) Media sense behaviour on various OS’s (most notably Windows) will bring a NIC down when a cable is disconnected. Either of these issues can lead to cluster instability and lead to ORA-29740 errors (node evictions). It’s my understanding that Oracle has tested against these chips and has verified that the issues above are not present on this particular chip. Um, well. Depending on your configuration you could run with anything from two IP adresses up to dozens or hundreds. The default configuration aims at 6 IP addresses for a DNS based configuration, or 5 addresses if you choose to go without DNS round robin. The ILOM requires 2 ip addresses (and 2 switch ports) if connected to the network, but thankfully this is optional. One solution-in-a-box design I’ve been working on uses only 3 IP addresses, one for each physical node and one for a virtual router that acts as a gateway for the (mostly) virtual network infrastructure. As for switch-less network configurations, as far as I know it was never a matter of Oracle not supporting RAC clusters with interconnect on crossover cables, just that they would not certify such an implementation. The difference is significant. With the ODA, Oracle have changed their views on a number of things, including redo multiplexing, crossover cables and a couple of physical laws. ODA does use crossover copper cables (although, these days such cables are not actually crossed) or twinax cables with integrated SFP+ interfaces if you prefer to use the copper ports for the public interfaces. Kindly send me the step by step to install Active/Passive configuration. Are you talking about RAC one node? When running the deployment, simply choose the advanced option, and you can choose between RAC, RAC one node (active/passive), and Enterprise Edition (only single-instance databases). Sorry for the delay. 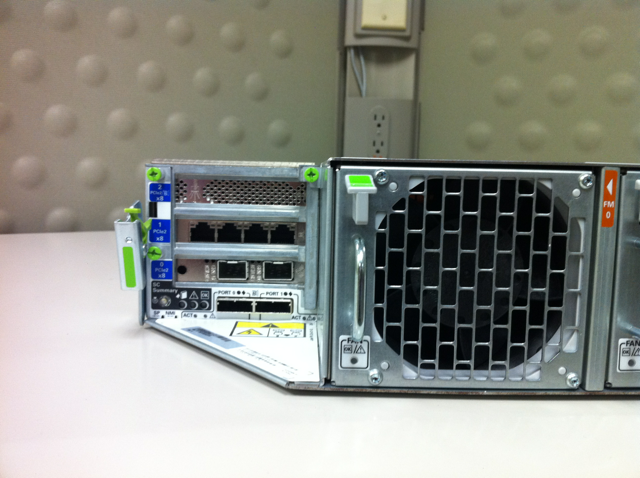 That port is The port that you’re looking at is eth7. Unfortunately, there is no way to change from high redundancy to normal. It requires a new deployment using version 2.4 of the Oracle Appliance Kit. Do you know if upgrading to OAK 12.1.x will let you change the redundancy configuration as it migrates to full ACFS? Yes, nasmel. Oracle Database Appliance Virtualized Platform is supported on the original ODA. Although, depending on the use case, the low amount of memory (when compared to ODA X3-2, X4-2 and the X5-2) may be a limiting factor.